Thank you for choosing Farmer's Cooperative Association. We are headquartered in Tonkawa, Oklahoma, and have branches in Ponca City, Tonkawa, Blackwell, Braman, Kildare, Sumpter and Perry. Look us up on Facebook. Our name is listed as Farmer's Co-op. Information about mycotoxin in corn and feeding precautions is available from Pennsylvania State University. Click here for the PDF, "Mold and mycotoxin problems in livestock feeding." Check your mailboxes soon for the winter issue of "Farm Lines" - and check the Newsletters page for previous issues you may have missed! 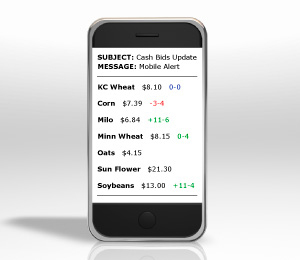 Farmer's Cooperative Association now has cash bids straight to your cell phone. Scroll down to sign up for text messages, which will include corn, wheat, soybean and milo prices and is delivered daily at 8:30 a.m. and 3 p.m.